There's a lot of discussion here about DJ hardware and software, but what about DJ controllers which can help tie the two together, and make using you software much easier? I'm thinking of getting a controller like this. Many DJ software users seem to prefer one with their set-up. Any comments? 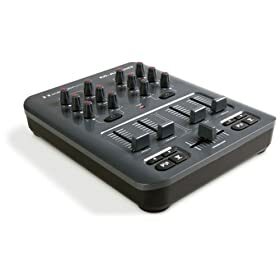 The other night I needed to actually DJ and discovered the real short fall of DJing purely with software... you can't lower one level while simultatiously raising another... thus I'm really tempted to get a simple SMALL controller to throw in my bag. The Vestax unit looks neat, it looks like the sound hardware plus hardware interface together. The Numark unit seems a little over priced for what it does, basically a bunch of knobs, sliders and switches to operate things in the GUI of the DJ software. You could probably make a home brew version for about $50-$100 parts. Less if you cannibalize a USB keyboard for the interface hardware. The M-audio is the same sort of deal as the Numark but costs much less. It's almost a reasonable price but still expensive for being nothing more than a special purpose keyboard (that's what the computer would see). A mate of mine at work has just asked me the same question (Hello Carl, if you're reading this). Numark Total control - similar to Vestax & Reasonably priced. I owned one for a while & really liked it. Reloop - Seems to be a copy of the Numark total Control. Again, two versions, ....with or without soundcard. Vestax VCM 100 - Slightly odd layout, as it uses rotary faders. does have onboard soundcard though. Vestax VCI 300 - Still a bit of an unknown at the moment. Designed to work with Serato's "Itch" software, but should be ok with Traktor (once they get the Hi-res midi problem sorted). Onboard soundcard, & excellent build quality. Stanton DaScratch - ask me in a few weeks time, after I've brought one! EKS Controllers. - Not sure about the new big "Otus", but a lot of people swear by the XP5's & XP10's. ......soundcard included as well. Allen & Heath Zone 1D & zone 2D - Serious kit! ....the 2D has the soundcard built in. Any other midi controller in the world. - Why not? you can configure your existing keyboard exactly how you like. I also own an M-audio Trigger Finger which I've used for DJing on several occasions. This site & it's forums are worth a read. Lots of good tips & comparison stuff. Perhaps because *his* spammy webstore doesn't sell them? As Swing Djs we need to give a small pause between songs so people can find a new dance partner so we dont really need fancy controllers . They are nice but not necessary . I find it easier to control things from the mixer ( usually most venues use one) with basic equaliser functions being sufficient . I totally agree with Philippe that a controller is nice but not necessary, there is plenty of time to prepare things in between song changes when DJ-ing for swing dancing. It is however really nice to have physical knobs and sliders to make small adjustments to each "Deck" in the software and also buttons to select, preview, load and start songs I think. I DJ primarily from an iPad although I consider start using a PC for better library functions and to be able to play .flac files (I know i could convert to ALAC, but anyway). I just bought a midi controller with a built in audio interface, Reloop Mixtour. No jog wheels or sample trigger buttons, quite basic and after trying it a bit at home I am very happy and eager to go live with it! The tactile side of real buttons instead of a mouse, keyboard or touchscreen input is quite pleasing. It is designed to work well with Djay software, but it is USB class compliant and uses standard midi over USB. There are profiles available for other softwares and you can make your own as well. I am currently working on a profile for Mixxx and it seems to be quite easy for the basic tasks. To make the start button for a deck blink when there is 30 seconds left on a track might need some scripting though It charges ios devices and the sound seems to be really good! Did anyone else try using a controller yet?